1. Trouée d'Arenberg, Length 2.4 km, 17th section of pavé 100 km from Roubaix. The Trouée d'Arenberg, Tranchée d'Arenberg, (Trench of Arenberg), Trouee de Wallers Arenberg is located close to Wallers and Valenciennes. It has become the symbol of Paris–Roubaix. Officially 'La Drève des Boules d'Herin', the cobbles were laid in the time of Napoleon I. 50°23′56″N 3°24′45″E﻿ / ﻿50.399°N 3.4125°E﻿ / 50.399; 3.4125. View location on map 50°23′56″N 3°24′45″E﻿ / ﻿50.399°N 3.4125°E﻿ / 50.399; 3.4125. 2. Mons-en-Pévèle, Length 3.0 km, 10th section of pavé before the finish in Roubaix. Mons-en-Pévèle, located in the municipality of Mons-en-Pévèle. 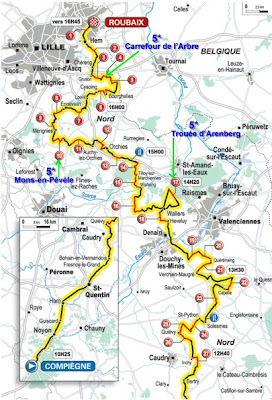 It is one of the key sectors, one of the toughest and within 50 km of the finish. It has been used every year since 1978, (except 2001). 3. Le Carrefour de l'Arbre, 2.1 km, 4th section of pavé before the finish 15 km away in Roubaix. Le Carrefour de l'Arbre (or Pavé de Luchin) located between Gruson and Camphin-en-Pévèle. Huge crowds gather here every year to await the decisive move. Cobbles that are rated five-star are considered to have "good conditions for the first 1,100m, then deteriorating, followed by 1,100m on which mud runs down from fields". That's pretty funny.